A bra made out of two taxidermied hedgehogs has sparked controversy in St Petersburg, with politicians and activists speaking out against it. The bra is displayed at the Erarta Museum of Modern Art as a part of the World of Wearable Art exhibition. Vitaly Milonov, Russian lawmaker infamous for his authorship of the “homosexual propaganda” law, has called for the museum to be shut down or fined because the exhibit ‘promotes violence towards hedgehogs’. The politician’s unexpected empathy was shared by local animal rights’ activist groups who branded the display ‘barbaric’. Apart from the hedgehog-adorned undergarment the display also includes bras made out of parrots, cacti and handcuffs. The exhibition Wow Fashion! World of Wearable Art, which is a display of the contestants of the New Zealand-based World of Wearable Art Award Show, opened on 6 October and is scheduled to remain on display until early February 2019. 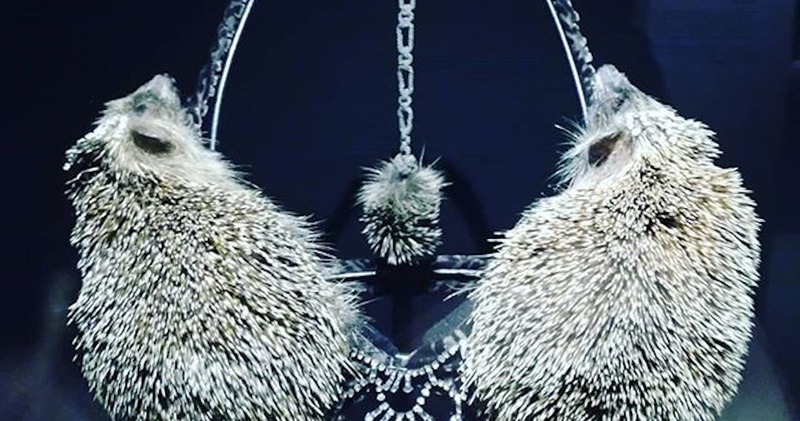 The hedgehog bra was made by designer Claire Third, who says she is an animal lover and makes taxidermy out of roadkill as a sign of respect for the animals. She has previously made headlines with a handbag made out of a ginger cat. The Russian public also has a long-standing relationship with taxidermy, as failed fox taxidermy known as ‘Stoned Fox’ was turned into a local celebrity, with the fox itself taken on a tour of Russian cities.